Extraordinary Measures is “inspired” by a true story about one man’s attempt to find a cure for his children who are suffering from pompe disease. This disease is extremely rare and effects how the body handles sugar which causes problems in the heart and skeletal muscles and in turn, life expectancy is quite low. The film however revolves around a happily married couple John Crowley (Brendan Fraser) and Aileen Crowley (Kerri Russell) who have three children and unfortunately two of them suffer from pompe. As John spends his spare hours investigating research papers and Dr. Google, he stumbles upon a scientist who has theorised a way to assist children with pompe. As John attempts to contact Dr. Robert Stonehill (Harrison Ford) on numerous occasions, he takes a gamble and goes to meet him in person. When he does meet Stonehill, he finds him quite arrogant and his easily distracted by his work and when he leads the doctor to believe that he can come up with money to further his research, an uneasy relationship is formed as John risks it all. The beauty of Extraordinary Measures is that I was not expecting the ending that I received, probably a little too jaded by those non-typical Hollywood endings which left me pleasantly surprised. The stars of Extraordinary Measures are Fraser as John and Ford as Stonehill who really make you like these characters, even the stuffy and sometimes rude doctor. Another star in the film is Meredith Droeger who plays Megan, their daughter effect my pompe and is brilliant as her character. 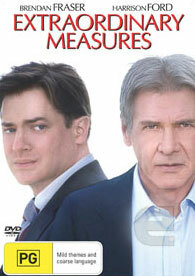 With good video and audio, Extraordinary Measures is a very engaging film that I could happily recommend to anyone who loves this genre. With a passionate story, perfect actors and good directing by Tom Vaughn, this movie captivated us from start to finish!